Perched high in the Palm Springs hillside, one property, Frey House II, stands out as a beacon of desert modernism and an emblem of the influential career of architect Albert Frey. Born in 1903 in Zurich, Switzerland, Frey was the only child to a pianist mother and business-owning father. Frey grew up encouraged to study architecture and did so at Winterthur’s Institute of Technology in Winterthur, Switzerland, completing his architectural degree in 1924 and subsequently beginning to practice throughout Europe. The budding architect quickly built a name for himself, landing prominent roles at Eggericz and Verwilghen in Brussels and Le Corbusier’s atelier in Paris. Despite succeeding in these European ventures, Frey ultimately dreamed of working in America. At the age of 28, his goal was realized. Frey arrived at Ellis Island in September of 1930 and within days started practicing at the office of A. Lawrence Kocher. Together, Frey and Kocher designed the 1931 masterpiece, Aluminaire House, a prefab metal case study that attracted more than 100,000 visitors in its mere 10 days on exhibition. Aluminaire House (soon being permanently relocated to downtown Palm Springs) boosted Frey’s repute, and shortly following he was offered a partnership at the New York practice of leading architect Philip Goodwin. However, Frey was determined to thoroughly study American architecture, declining offers in New York to instead drive cross-country. In 1934, Frey arrived in Palm Springs to oversee the building of one of his designs. Here he met architect John Porter Clark, who welcomed Frey’s collaboration. 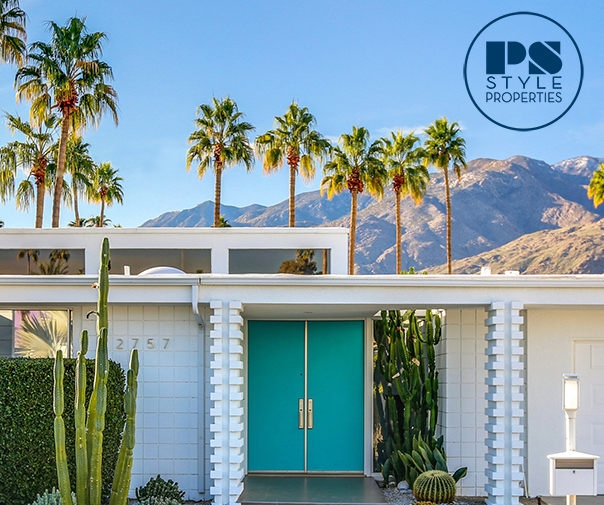 Excited by the results of their early shared projects, including the San Jacinto Hotel in Palm Springs (now the Movie Colony Hotel) and the Wright Ludington House in Rancho Mirage, the pair decided to officially join forces. In 1939, the Clark and Frey architectural firm opened in Palm Springs. For nearly 20 years, the duo of Frey and Clark together contributed iconic architecture to the desert. Palm Springs City Hall, the Lower Station of the Tramway and countless homes are products of their combined creative efforts. Clark left the firm in 1957 to establish a solo practice, and Frey continued his own practice, fusing modern design with his desert surroundings. Perhaps the pinnacle of Frey’s work — revered then and now — is Frey House II, the second home Frey built for himself in the desert. 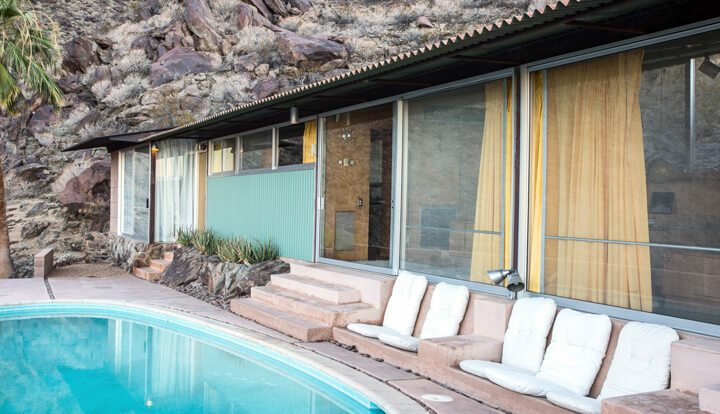 “Frey House II exemplifies the distinctive characteristics of Albert Frey’s approach to residential design in the desert,” says author and architectural historian Peter Moruzzi, who cites congruence with natural surroundings and economy of materials as integral components of Frey’s designs. Originally only 800 square feet, Frey House II is a compact yet complex archetype of desert modernism. Before its design, Frey spent a year studying the sunlight’s affect on the home’s anticipated mountainside location. When construction began in 1963, Frey chose steel framing, ribbed aluminum sheets and glass walls as his building materials. Serving as the roof of the carport are the home’s swimming pool and small deck, with built-in chairs looking out over the expanse of the valley below. Nearly as striking as the view is the enormous boulder that serves as the home’s natural partition between the living and sleeping spaces. Instead of removing this section of the jutting mountain, Frey built around and into it. In an effort to preserve the mountain, Frey cleverly utilized the small space rather than expanding his building grounds. Nearly all of the home’s furniture is built-in, with storage, shelving, a safe and a record player efficiently integrated into the walls, ground and furniture. As a result, Frey House II is minimal and void of clutter. The dining table, which doubled as Frey’s work desk, features a hidden pencil sharpener that was used while sketching. Remaining conscious of the natural surroundings, the home’s bright, yellow curtains reflect surrounding Encilia flowers. The concrete floor is tinted the same color as surrounding rocks, and the ceiling is painted an aqua blue to resemble the sky. These meticulously planned features integrated Frey into the landscape that so heavily inspired his work. Save for an additional 300-square-foot bedroom added in 1967, the property remained largely the same over the years and served as Albert Frey’s home until his death in 1998. The architect bequeathed Frey House II and its contents to the Palm Springs Art Museum, along with an endowment for its preservation so that others could study and experience this quintessential example of desert modernism. Anyone else notice that the pencil sharpener is installed backward? Thanks for these Wonderful articles covering Palm Springs. I truly enjoyed the photography of the Inside of the House. I love to enjoy the view from Temple Isiah. I would enjoy going on a Tour of these Historical Homes.